Summertime is camp time in the sports world for pro basketball and football athletes. From veterans to up-and-comers like Tarik Cohen and Darius Leonard, many big-timers set aside time from training and living the good life to give back to the youth. While the pros are the headliners, it takes more than just a name to bring these events together conceptually and logistically. While these events last just a few hours, they involve weeks to months of planning and promoting to pull off effectively. 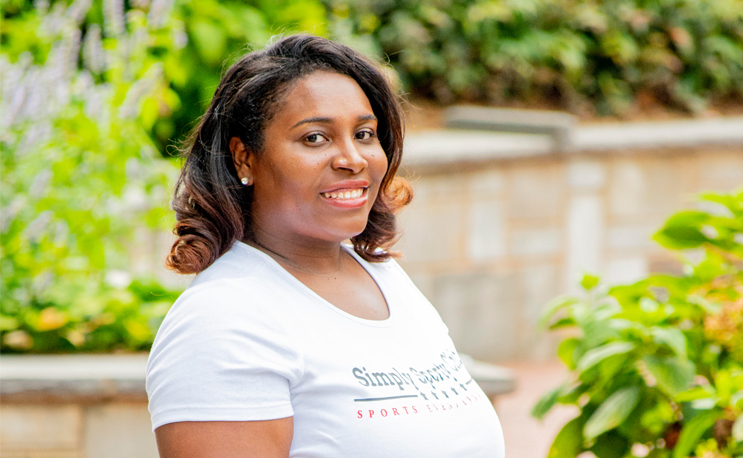 Enter Alexxis Hutchinson, owner of Simply Sporty Chic. When the stars want to make sure their camps go right, they call the Winston-Salem State alumna who has spent the last decade sculpting a career that has seen her go from intern to brand builder to CEO. Growing up in a family of sports fans, Hutchinson decided to major in sports management when she left Chesapeake, VA for WSSU. She spent her time interning in the school’s sports information office and eventually landed an internship at the CIAA. With a mother who graduated from Norfolk State and a sister that graduated from Virginia State, Hutchinson was already familiar with the conference. She landed a job after her internship and ended up as Assitant to The Commissioner before moving on to IMG College. Going to IMG College, the largest collegiate sports marketing company in America, was different from the CIAA in that as a black woman working in sports, she was often one of the few people in the room who looked like her. While it was a positive experience for her, she knows that may not always be the case as a double-minority in a field still looking to diversify. “One, you always have to have thick skin. But you also have to know you belong. You have to know that in this circle, I belong here. You know, you work hard, you do the internships, you get the education…you have to feel entitled,” she said. While she was at IMG she started a Twitter account to get the word out about what the company was doing. Her sister, Grambling Assistant Athletic Director for Compliance Tiffani Sykes, encouraged her to use the name @simplysprtychic, the name that would eventually become her brand and company. So far this summer, the 32-year-old has worked behind the scenes at camps for Minnesota Vikings defensive back Jack Tocho, NBA veteran Anthony Morrow, Grizzlies guard Briante Weber and Clippers guard Mike Scott. She’s also helped put together events for Norfolk State basketball coach Robert Jones and football coach Latrell Scott. Despite her many titles and roles, Hutchinson is most proud of her title and role of mother. Her daughter, Domenique, is the center of her world and the top of her Twitter page. It’s something that takes planning, dedication and balance, she says. “It’s very tough being a mom in the sports world. She’s playing travel soccer and she’s doing competitive cheer. I always have to make time to make sure that I’m at those competitions,” Hutchinson said.